Wikimedia Commons has media related to Anemone nemorosa. Wood sorrel Oxalis acetosella, which grows in similar shaded places, can be readily distinguished by its ternate and clover-like leaves and smaller flowers with 5 white petals and 5 sepals. The plant contains poisonous chemicals that are toxic to animals including humans, but it has also been used as a medicine. All parts of the plant contain protoanemonin, which can cause severe skin and gastrointestinal irritation, bitter taste and burning in the mouth and throat, mouth ulcers, nausea, vomiting, diarrhea, and hematemesis. This species spreads very slowly in UK forests, by as little as six feet per century, so it is often used as an indicator for ancient woodland. Anemone nemorosa is grown as an ornamental plant for use in gardens and parks. Grown from seed the plants take around five years to flower. Many cultivars have been selected for garden use, such as Anemone nemorosa 'Allenii' which has large blue flowers. It has been awarded an Award of Garden Merit (AGM) H4 (hardy throughout the British Isles) by the Royal Horticultural Society, as have several of its cultivars (see below). 'Virescens' (AGM H4) - flowers mutated into small conical clusters of leaves. 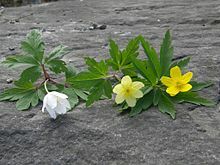 Anemone × lipsiensis, a hybrid between A. nemorosa and A. ranunculoides, has pale yellow flowers; A. × lipsiensis 'Pallida' is the best-known result of this cross. It has been awarded the AGM H4, like both of its parents. Anemone nemorosa is the inspiration for Simbelmynë, a flower in J.R.R. Tolkien's legendarium of Middle Earth. In The Lord of the Rings, simbelmynë was a white flower that grew notably on the grave mounds of the Kings of Rohan outside Edoras, and most abundantly on the burial mound of Helm Hammerhand. The name, also translated from Old English as Evermind, refers to the flower's blossoming in all seasons of the year. ^ a b c Stace, C. A. (2010). New Flora of the British Isles (Third ed.). Cambridge, U.K.: Cambridge University Press. p. 88. ISBN 9780521707725. ^ Blank, S. and M. Wulf. 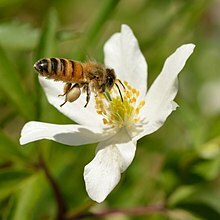 Investigations on seed production and pollinator biology of Anemone nemorosa (Buschwindröschen). Leibniz-Centre for Agricultural Landscape Research (ZALF). 2008. Shirreffs, D. A. 1985. Anemone nemorosa L. Journal of Ecology 73: 1005-1020. Philip, C. Plant Finder 2008-2009. ISBN 978-1-4053-3190-6.